The world is breathing a collective sigh. MSNBC is reporting that former South African President Nelson Mandela has been discharged from the hospital after undergoing treatment for a lung infection. Deputy President Kgalema Motlanthe, speaking at a press conference, repeated previous assurances, saying there was "no need for us to panic." South Africa's surgeon general, Vijay Ramlakan, confirmed that Mandela, 92, had undergone "a few specialist investigations" after being admitted to the hospital earlier this week. 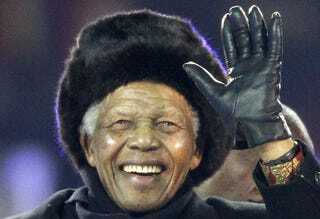 Ramlakan said that Mandela's "amazing, positive attitude allows him to cope with the difficulties of old age with the greatest of graces." Grace and Mandela go hand in hand. In other news: NFL Players to Lose Millions If Deadline Isn't Met.